iPhoning it in from our other blog. I've been spending some time with the iPhone 2.0 software, and I have to say I'm pleasantly surprised with many of the new enterprise features. 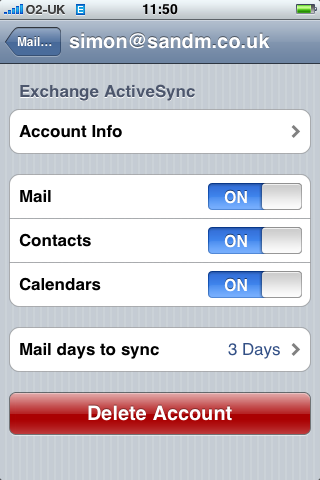 Setting up an iPhone to connect to an Exchange server was quick, and relatively painless. 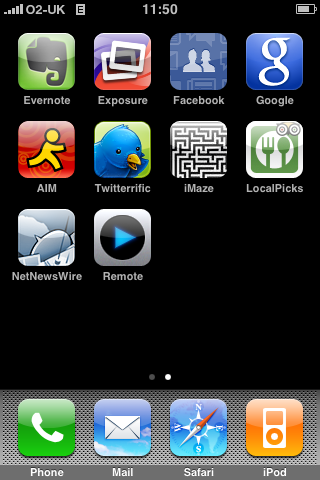 Apple's implementation of ActiveSync supports self-issued server certificates directly, and so smaller businesses can work the CEO's iPhone without having to set up an expensive third-part certificate. Each phone will have to be set up by hand, so you may prefer to stick with Blackberry or Windows Mobile for ease of management. Go read the rest of the piece for the rest of the images! Sure the iPhone is cool, but how many people are buying a smartphone just to get Web access at work? A lot of our friends who blog using LiveJournal (probably the most community-oriented blogging platform) have commented recently that they’re losing access to LiveJournal and other sites at work - so they’re buying a smartphone so they can carry on accessing them. I keep wondering how much of the recent jump in smartphone Web browsing is down to phones being almost good enough, networks being almost fast enough and data plans being almost cheap enough - and how much of it is annoyed or paranoid people being forced to put their social network in their pocket to stay in touch during the working day. Remember to make any comments over there!